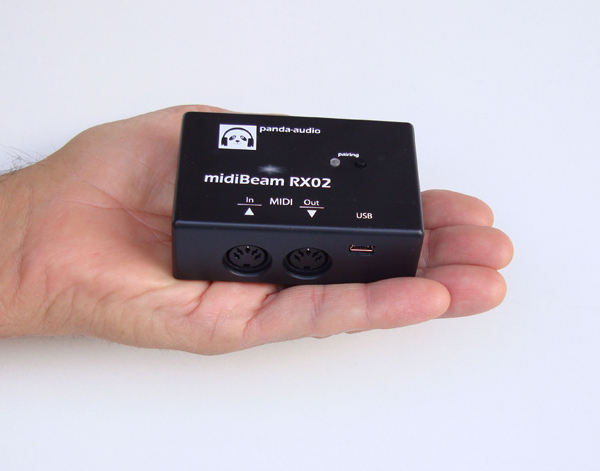 Make your MIDI controller wireless - choose midiBeam v2! any iOS 7+ device (iPhone, iPad) with a Camera Kit. Connect the TX02 unit to your controller's MIDI Out jack, and switch them on. The small box is ready to air your performance data. (AAA size batteries are needed). But it's not the full story. 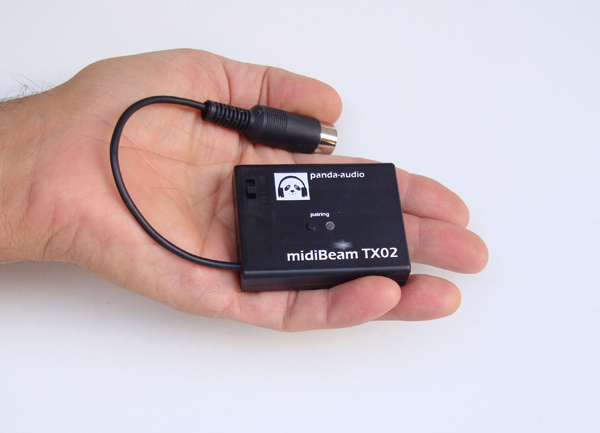 You can use a maximum of as much as 76 midiBeam transmitter-receiver pairs at the same place without any interference - just use the units' Pairing button to connect them. And we still have a surprise. RX02 can act as a simple USB-to-MIDI cable interface with MIDI In and Out if you don't need the wireless operation apparently. Installing the system is a breeze: no driver software is required and you don't have to fight with different settings - both boxes are plug-and-play devices. After shipping a massive 4,000 systems worldwide, providing safe wireless MIDI connections for the biggest artists at the biggest stages, we have decided to take a serious step into an even more sophisticated solution. It is midiBeam v2. It contains hardware and software improvements as well - all our existing users can enjoy all the advantages of the v2 system as a free update so everyone’s investment is saved. now we provide a web based utility where you can refresh the system’s firmware and set all the operation parameters of your midiBeam system. „And it works GREAT!! Even inside the sax bell of the Synthophone, with the metallic cover on, fully enclosed (!!) I get a flawless performance of wireless MIDI, tested at a distance of over 10m thru concrete walls in between TX02 and RX02!“ - Martin Hurni of Softwind Instruments, inventor of Synthophone. So far I am impressed! I like the extremely small size of the TX unit and the lack of an external antenna. The unit I used previously had an antenna broken down twice." "Pairing was easy, I just had to find a reliable USB power supply. When I did, I hooked up the unit to my AX-1 and my Korg Kronos and took a walk around the house. No drop outs or any kind of adverse operation." "Package has arrived yesterday. I quckly gave it a try, the result of the first short test: is it's perfect!" We believe in quality - we provide a limited lifetime warranty of repairing or replacing your units if they go defected. We ship you your orders to your PayPal registered address unless you specify an alternative - just send us an email to pandamidi.elektromedia@gmail.com. Your price on a single midiBeam v2 system (RX02 + TX02, without batteries) is 179 EUR, including handling and shipping to any place all over the world, wherever you live. Click on the image below or visit our store to order midiBeam today! As you will probably notice from the data sheet we seriously outperform all the competitive products found on the market today. We come first in every key feature. And don't forget: this beauty comes at the lowest price on the market!